Sign the Cut Your Own Tree Liability Waiver, located inside our barn. Be cautious of field hazards: holes, tree stumps, etc. Do not cut Spruce trees before December 10th for best needle retention. Cut tree close to the ground. Cut only the tree you plan to pay for, cutting multiple trees will result in a fine. 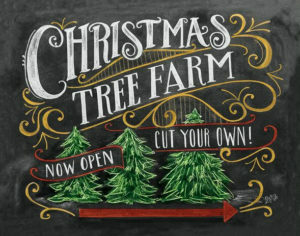 Transport your tree to the barn for processing and payment. Personal photographs are permitted, no professional photography without a signed agreement. Please cut and transport your tree before 5pm to leave adequate time to process and pay for your tree. The Scotch Pine trees have had a fungus blight that have now reached into our last field of Scotch Pine. We will no longer be planting Scotch Pine, but will continue to ship them into our barn lot! *The fungus does not pose any danger to humans or pets.